Why We Should NOT Celebrate Columbus Day | Taino Woman Comes Dancing...in the spirit of Hatuey! ~ Columbus Day recognizes the achievements of a great Renaissance explorer who founded the first permanent European settlement in the New World. The arrival of Columbus in 1492 marks the beginning of recorded history in America. Actually the Vikings have been recorded as the first to have inter-continental contact, having had a settlement in Newfoundland, Canada. The findings were dated between 620-1250, over 200 years before Columbus’ landing in the Caribbean. The reason why they discontinued their expansion was that they became Christianized and thus part of the christian empire. They focused on becoming crusaders instead. Before the Europeans imposed their own system of writing (using the alphabet) there were various systems of written language in use in the Americas: Mayan hieroglyphics, wampum (Encyclopedia of the Haudenosaunee(Iroquois Confederacy) By Bruce Elliott Johansen & Barbara Alice Mann), pictographs (like Egyptian writing), and the oldest, dated at 5000 years of age, quipu. Just because the indigenous American histories weren’t written in a European based alphabet doesn’t mean it wasn’t recorded at all. Writing has never been limited to the modern alphabet; note Cuneiform, Egyptian pictographs, the many varied Asian writing symbols, as well as Arabic, Hebrew, Burmese and the various African writing systems. ~ Columbus Day celebrates the beginning of cultural exchange between America and Europe. After Columbus, came millions of European immigrants who brought their art, music, science, medicine, philosophy and religious principles to America. These contributions have helped shape the United States and include Greek democracy, Roman law, Judeo-Christian ethics and the tenet that all men are created equal. Art, music, science, medicine, philosophy and religious principles we already present in the Americas upon European arrival. If it weren’t for indigenous science and medicine and the indigenous people’s spiritual principle of compassion and brotherhood of men, the first Europeans would not have survived since they knew nothing of American herbs, medicinal nor edible plants and animals. The first European settlement, La Navidad, was destroyed by the natives due to the Europeans Judeo-Christian “ethics”. Their behavior continued by the men who returned later , was recorded by friars who were men of that time, and were appalled at the behavior exhibited by the conquerors towards the natives. Native arts, crafts and music is still enjoyed today by many and has even become federally protected due to copying, bootlegging and plagiarism. The idea of a democracy came from the Iroquois Confederacy, the oldest living participatory democracy on Earth. ~ Columbus Day is one of America s oldest holidays. The tradition of observing Columbus Day dates back to the 18th century. It was first celebrated on October 12, 1792, when the New York Society of Tammany honored Columbus on the 300th anniversary of his first voyage. ~ Columbus Day is a patriotic holiday. In fact, the Pledge of Allegiance was written in 1892 in honor of the 400th anniversary of his first voyage. That year, President Benjamin Harrison declared Columbus Day a legal holiday. The US had been at war almost continually during the 18th century: American Revolution 1775-1763, Franco-American Naval War 1798-1800, Barbary Wars 1801-1815, Second American Revolution 1812-1815, Creek War 1813-1814, Texas Independence from Mexico 1830-1836, Mexican-American war 1846-1848, Civil War 1861-1865, Spanish-American war 1898… People tire of continuing wars and patriotism was encouraged to inject new fire into soldiers and a population whose support for war was waning. The Pledge of Allegiance was written in 1892 by Francis Bellamy and had nothing to do with Columbus. Columbus Day was used as a tool to sell flags to schools and its recital was to be part of the celebration. ~ The United States has long admired Columbus. 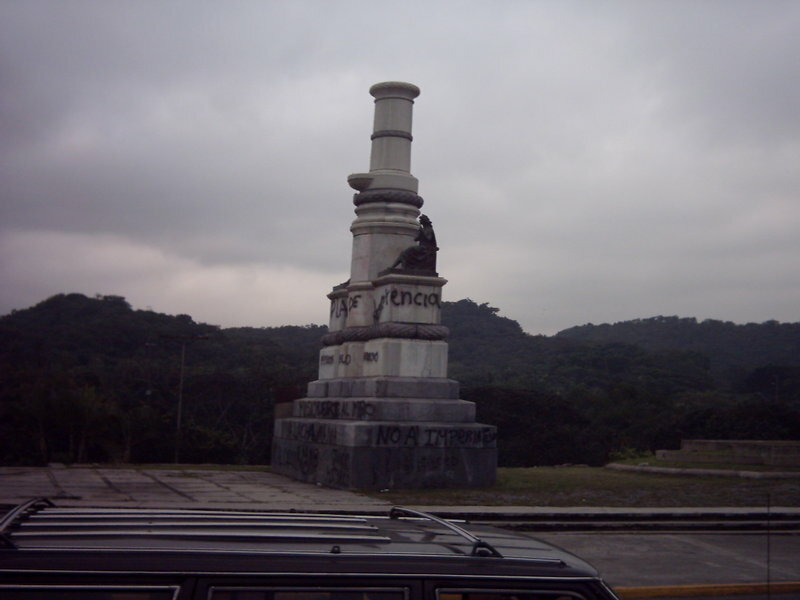 America has more monuments to Columbus than any nation in the world, according to the Christopher Columbus Encyclopedia. These include a Columbus statue in Providence, R.I., cast by Frederic Auguste Bertholdi, who created the Statue of Liberty, and one in New York City, created by one of the six Italian American brothers who carved the Lincoln Memorial. Again quantity doesn’t support continuity. Saddam Hussein had a monument built in his honor and it was torn down. There are steps being taken to tear down Columbus monuments world- wide as evidenced by the photo above. There are many more sculptured birds than those commemorating Columbus and we don’t have a federal holiday celebrating them! ~ The United States has a significant collection of Columbus memorabilia, including his desk, papers, and the cross he used to claim the New World for Spain. These are in the Columbus Chapel in Boalsburg, Pennsylvania. Antiquities sell for a pretty penny. This does not support the creation or continuation of a federal holiday. ~ In 1971 Columbus Day became a federal holiday in all 50 states after Congress passed a law declaring the second Monday in October Columbus Day. Federal laws can be changed. This does not support the continuation of the holiday. ~ Columbus Day also commemorates the arrival on these shores of more than 5 million Italians a century ago. Today, their children and grandchildren constitute the nation s fifth largest ethnic group, according to the U.S. Census Bureau. According to the Library of Congress “In the 1880’s they [Italians] numbered 300,000; in the 1890s, 600,000; in the decade after that, more than two million. By 1920, when immigration began to taper off, more than 4 million Italians had come to the United States.” This has no relation to the date of Columbus’ arrival in the Caribbean, Italian arrival to the Americas, nor does it correlate to any of the dates of observation. According to the U.S Census Bureau (June 2004), Italians were the fifth largest ethnic group preceded by Germans, Irish, English and African Americans- in that order. No days are noted to commemorate the arrival of these people who are more numerous and may have more reason to be commemorated than Italians are. ~ Columbus Day is the only day on which the nation recognizes the heritage of an estimated 26 million Italian Americans. Maybe Italian Americans can pick another day to commemorate their heritage: June 2nd is good; the birth of the modern Italian Republic. Maybe they can pick a date related to the Renaissance or the Risorgimento. 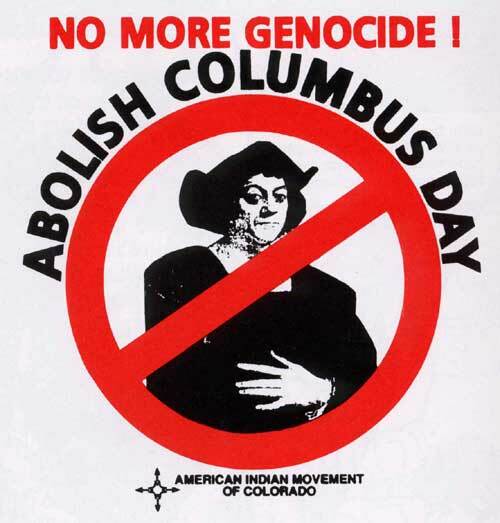 But to insist on commemorating Columbus who brought nothing but pain, devastation, genocide and slavery to the indigenous people of this hemisphere is tantamount to someone suggesting they pick a date that also commemorates their subjugation under Spain or France or Austria. Or a date related to the plagues that devastated them for 300 years (14th-17th centuries). Or – gasp!- July 29th, the date of birth of “His Excellency Benito Mussolini, Head of Government, Duce of Fascism, and Founder of the Empire” (official title) as an appropriate date to celebrate being Italian. That’s a bitter pill to swallow, ennit? You might want to walk a mile in those moccasins before justifying the continuation of Columbus day.